Lineage. Constituted as 343 Bombardment Squadron (Heavy) on 28 Jan 1942. Activated on 3 Feb 1942. Redesignated as 343 Bombardment Squadron,Very Heavy, on 23 May 1945. Inactivated on 27 Mar 1946. Activated on 1 Jul 1947. Redesignated as 343 Bombardment Squadron, Medium, on 28 May 1948. Discontinued, and inactivated on 25 Jun 1966. 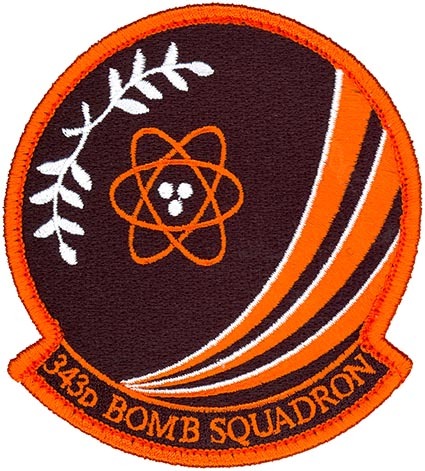 Redesignated as 343 Bomb Squadron on 9 Mar 2010. Activated on 1 Apr 2010. Assignments. 98 Bombardment Group, 3 Feb 1942; 40 Bombardment Group, 10 Nov 1945-27 Mar 1946. 98 Bombardment Group, 1 Jul 1947; 98 Bombardment (later, 98 Strategic Aerospace) Wing, 16 Jun 1952-25 Jun 1966. 917 Operations Group, 1 Apr 2010-. Stations. MacDill Field, FL, 3 Feb 1942; Barksdale Field, LA, 16 Feb 1942; Ft Myers, FL, 30 Mar 1942; Drane Field, FL, 15 May-3 Jul 1942; Ramat David, Palestine, 7 Aug 1942; St Jean, Palestine, 21 Aug 1942; Kabrit, Egypt, 10 Nov 1942; Gambut, Libya, 31 Jan 1943; Lete, Libya, 3 Mar 1943; Hergla, Tunisia, 25 Sep 1943; Brindisi, Italy, 18 Nov 1943; Manduria, Italy, 19 Dec 1943; Lecce, Italy, 17 Jan 1944-19 Apr 1945; Fairmont AAFld, NE, 8 May 1945; McCook AAFld, NE, 25 Jun 1945; March Field, CA, 10 Nov 1945-27 Mar 1946. Andrews Field, MD, 1 Jul 1947; Spokane AAFld (later, Spokane AFB; Fairchild AFB), WA, 24 Sep 1947; Yokota AB, Japan, 5 Aug 1950-22 Jul 1954; Lincoln AFB, NE, 25 Jul 1954-11 Nov 1955; Lakenheath RAF Station, England,12 Nov 1955-28 Jan 1956; Lincoln AFB, NE, 29 Jan 1956-25 Jun 1966. Barksdale AFB, LA, 1 Apr 2010-. Aircraft. B-24, 1942-1945; B-29, 1945; 1947-1954; B-47, 1954-1966. B-52, 2010-. Operations. Combat in Mediterranean Theater of Operations (MTO) and European Theater of Operations (ETO), Aug 1942-15 Apr 1945. Awarded a Distinguished Unit Citation (DUC) for combat action in North Africa and Sicily, Aug 1942-Aug 1943; received a second DUC for raid on Ploesti, 1 Aug 1943. Combat in Korea, 7 Aug 1950-25 Jul 1953; received a DUC for service in Korea, Dec 1952-Apr 1953. Began training mission after Korean truce, Aug 1953-May 1954. Returned to US in Jul 1954. Transitioned to B-47, Sep 1954-Feb 1955. Trained for long-range bombardment missions, 1955-1966. Activated in April 2010 as an associate unit to support B-52 operations, conventional and nuclear. Campaign Streamers. World War II: Egypt-Libya; Air Offensive, Europe; Tunisia; Sicily; Naples-Foggia; Anzio; Rome-Arno; Normandy; Northern France; Southern France; North Apennines; Rhineland; Central Europe; Po Valley; Air Combat, EAME Theater. Korea: UN Defensive; UN Offensive; CCF Intervention; First UN Counteroffensive; CCF Spring Offensive; UN Summer-Fall Offensive; Second Korean Winter; Korea Summer-Fall, 1953; Third Korean Winter; Korea Summer-Fall, 1953. Decorations. Distinguished Unit Citations: North Africa and Sicily, Aug 1942-17 Aug 1943; Ploesti, Rumania, 1 Aug 1943; Korea, 1 Dec 1952-30 Apr 1953. Air Force Outstanding Unit Award: 1 Jul 1964-1 Jun 1965. Republic of Korea Presidential Unit Citation: [7 Aug 1950]-27 Jul 1953. Emblem. Approved on 15 Apr 1957.